Online Orders, Order Distribution, Automatic Invoicing, Send High Resolution Images Directly To your Clients, Professional Customer Database, Financial System, Newsletters and More!!!! From $29.95 per month** Contact Us! The software has two log ins, one for a customer and one for an admin, please read the features below. As an admin, you add as many products as you wish for a customer to use the order form. The order form is totally changeable. e.g, professional photography from $225.00 (add tax if applicable). The customer can also pay via a payment gateway at this stage. You can turn on "self-service" which means you can allow your customers to build their own tours using their own photos. They will pay through your gateway and can be passive income. You can add as many staff members as you wish and give them different user privillages. ie. Co ordinator, Graphic Designer, Photographer, Constructor. Each staff member has their own log in and you can attach any staff member to a job. For example. If a photography shoot was ordered, you would probably want yourself as a co ordinator, assign a photographer to the job as well as a graphic designer (for post production). When this is done, your staff will be alerted via email to log in to see the job specs. They can write private notes to all people involved. i.e Weather bad next 5 days, will shoot on Wednesday. etc. You can add your customers details into the system so that you can place an order on behalf of a customer, view/edit a customers tours, view their accounts (invoices/PDFs, whats been paid, what is owing), create a new invoice or add a customer note. You can run a report (excel) per month to see how many orders, from who and how much. You can also mark invoices as paid, or view the master invoices or all statements. (note: each time a customer orders a product, they will be invoiced or if they are on a credit limit, they are invoiced at the end of the month). You can build a template for a customer, ie for their virtual tour, color schemes and logos and save this as their default, so that you only ever have to do this once, when either they order from you, or if they are using the self-service system. You can send out monthly newsletters to all of your customers. You can issue a discount code of a % or $ value so that when a customer enters this, it will change the price accrodingly. (Note: it is specific for the valid email address associated with the customers account). You can either manage your appointments or place appointments in your "staffs" organizer. i.e photoshoots, meetings etc. You can oversee all appointments, set alerts and more. You can add agent profiles into the database so when building a tour for the same agent you only ever have to select their name and their contact details will appear. This system is a very well thought out photo sharing system where a photographer can upload (RAW or unedited) files to a job. Once the files have been fully uploaded they can alert the co ordinator or Graphic Designer. The files can then be downloaded, worked on and re-uploaded as the "FINALS". Once these have been uploaded, you can alert the customer, who can log in and download the files from their log in. Note: You can upload or download multiple jobs at once. Once an order has been placed by a customer, admin are alerted via their default email. Once they log in, the order will be in "Pending" status until the job has been assigned. You can place the job into constructing, photographing or complete. (and alert, either the photographer or customer). The job order will be a comprehensive overview of the whole job. It will show the invoice (paid or unpaid). The customers details, The staff associated with the job. Any notes on the job. (there is weather pattern software to work out when its best to do the job) You can enter the job in appointment organizers, write notes about the customer, print the job off, upload final photos or build a tour. We create a log in portal within your website, your customers can become a member of your portal, or log straight in to order. (Remember you can also take phone orders and order on behalf of this customer. It is best to do this so that your customer is auto-invoiced for your accounting purposes). They can use the Order Form to book a job, they can Manage/View Their Orders, pending, awaiting approval (i.e virtual tours that need their approval), Download Photography, Manage and Pay Finances, Manage/View/Edit Tours, use The Floor Planning Tool, or View Useful Downloads. Note: Each tour created has its own specific URL, however you can purchase a domain name and point it at any tour. If you have access to a Virtual Tour camera, you can build an interactive 360 degree virtual tour by uploading your spherical images to our system. We have two platforms, Java & Flash so you can choose either one to display your virutal tours. With our Virtual Tour system, you will have the ability to create hotspots on every photo. This means you can link every virtual tour scene to the next to create a walk-through type tour. Now you create Virtual Tours with your panoramic images. Simply upload your 180 degree images and select the '180 degree tour viewer'. You can also add hotspots to any image to link to the next virtual tour scene. 180 degree Virtual Tours can be as effective as 360 degree Virtual Tours with no need for special cameras. 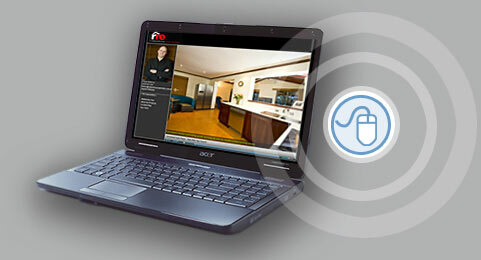 If you have a video of a property, now you can upload it to our system. The file must be in .flv format, however if you send the files to us we can convert them for you. We do have conversion software you can download from our system. You can also add hotspots to floor plans and maps that link to videos. Now you can have a video without using a camcorder. Simply use your own photos, upload them to our system and set the transitions on every photos, zoom, panning and much more! You can overlay text on your video-like tour and animate that text to describe the photos and create a virtual video without the lengthy editing process of real video! Photo Slideshows are nothing fancy, however we have three styles to choose from, panning, thumbnail and fading. you can also create multiple galleries within the slideshow to filter out the property you are marketing from 'About The Area' photos. You can add text and captions and have a full screen option. Upload your .jpg photos or .swf (flash) pages to create a unique flipping magazine. This magazine will feel like you are turning the pages. If you are tech savvy, you can even embedded flash video within the pages. Brilliant for agent profiles. We have built the most comprehensive realtor software package on the internet. We originally built our software for in-house use only, however with more and more people asking us if they could use it, we decided that it was a good idea to let someone like you have the option to have the use of it for a minimal cost. The software is not just a virtual tour system. It is a very well thought out business solution for photographers, realtors, marketers and web designeres. The software is fully integrated with your current website and will be seemless to your current customers. They will log straight into an intuitive back-end that is branded with your company colors and logos. Now you have the option to use Panofactory's unique software for your very own. We offer you our software to use and we take a percentage of what is sold through your portal. Create, or let your customers create unlimited Virtual, Photo and e-Book Tours through your very own portal designed in your color scheme. Every tour can be sent to any email address for confirmation. Every tour can be automatically billed to each customer or each customer can pay via visa online straight into your account. We can even integrate our software with your current database. For an obligation-free chat, please contact us with your inquiry and we can assist you with any of your needs. ** conditions: All prices per month are subject to the daily traffic and size of the business. $29.95 is a standard stand-alone photographer, prices are negotiated with Regroup management.